Q: What brings you to Sri Lanka? A: I am here to visit companies that we have invested in. Q:: Is this an annual exercise? A: Yes we come at least once a year or sometimes twice a year depending on the situation of the market. I was in Sri Lanka in October 2014. Q: Is this visit part of a regional tour? A: Yes. I came from Romania where we have a large fund there. Before that I was in India. Next stop is China. 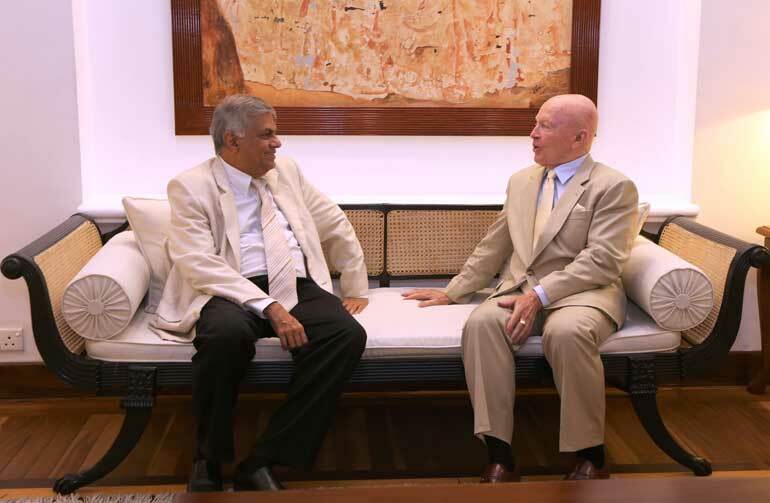 Q: I understand you had the chance to visit some parts out of Colombo. What are your initial impressions between the last visit and the current one? A: Last time I was only in Colombo. This time I went to Trincomalee, where I haven’t been for perhaps 20 years. There has been change. Going across the country the big change I found was the improvements of roads. We were able to drive back all the way via Sigiriya and Kandy. It was quite nice. Q: How big is your portfolio in Sri Lanka? A: We have about $ 2 billion in Government debt and about $ 100 million listed equities such as JKH, Commercial Bank, HNB and Hemas. We like to do more. What worries me here is special taxation, especially unpredictable ones such as the retrospective Super Gains Tax. We need to look at carefully since it impacts listed companies. We also like to see the Government continuing infrastructure spending. This must be combined with a more business-friendly environment. That is why I hope they will continue with the Port City project and casino/gaming licences, which I think will reinvigorate the economy. Q: Has your portfolio seen growth? A: It has, especially in fixed income side (Government Bonds), which we started about two years ago. Q: This year we have had a flight of foreign investments in Government Bonds. Have you been holding on to your investments in Government Bonds as they remain attractive? How confident are you? A: Yes, we are confident that the following change in the Government, there is commitment to strengthening the Budget to make sure they will pay their debt, which is a good sign. However, I still feel it would have been better if there had been no retrospective tax. Perhaps the Government could have found an alternate way to raise money. Q: What would be the best practices in taxation given your experience in emerging and frontier markets? A: The personal income tax level in Sri Lanka is good. With regard to corporate income tax, there is room for a lowering of the rate. I believe a lower rate applied uniformly will ensure a higher collection. High rates lead to evasion. I understand the Government has a budget to meet but it should rely more on maybe VAT that is spread evenly across the economy, and which is systematic and predictable. When you pass a retrospective tax like the SGT, it scares a lot of businesses and investors. Effective taxation in Sri Lanka is very high. Q: The Government justified the SGT to finance the much-needed relief to the poor and as part of a stimulus package for the economy. How have governments in other parts of Asia approached funding aspect of their own stimulus? A: What they have done is looked at employment situation. They have decided that in order to help the poor, you need to give them employment; for employment, you need to encourage business and investments. This is a more productive approach. For Sri Lanka, tourism is a good conduit to generate jobs and income faster. I have seen greater emphasis on tourism here. The Government needs to encourage tourism investments by major international brands. There are a number of new hotels being built and this is a step in the right direction. These hotels will provide employment for more people but Sri Lanka has to ensure more of that. Q: The Government is busy with the Budget for 2016. There is debate on whether more incentives must be offered for foreign investors or not. What would be your advice? A: Let’s take tourism for example. Maybe the Government should consider permitting long-term leases for foreign investors on pre-identified/allocated land if outright purchase is not possible to build hotels. Offer a two or three year tax free period followed by a lower rate for a further period. This will justify big investments in Sri Lanka. The level of tax relief should depend on the degree or size of investments. This will provide an immediate boost in terms of investments, jobs and drawing more tourists, if it is by big global hotel chains which will promote Sri Lanka extensively. Q: How do you find Sri Lanka as a tourist destination? A: Very good. You have great weather, beaches, history, heritage and culture. So as a destination Sri Lanka can draw much more foreign investment. Sri Lanka needs to look at lessons learnt by other destinations in terms of attracting higher foreign investment into tourism. Q: What countries can Sri Lanka follow in getting tourism policy and growth right? A: I think the Singapore model with regard to casinos is a great example. They laid out conditions/restrictions as well as offered incentives/tax concessions to draw big investments. Q: For one of your investments, JKH is going ahead with its integrated resort project sans casino/gaming activity. Do you think Sri Lanka should revisit its stand of not allowing any more new gaming activities? A: Yes definitely – particularly casinos sponsored by major companies like Sands, Wynn, Kerry Packer or Genting. They know how to run major casino operations. You can draw them with right terms and conditions. You can tell them at least 50% of their earnings should come from non-casino business. Then they will drive entertainment and leisure activities. Q: One debate against casinos is that tourist destinations which are thriving on gaming is due to the lack of natural attractions for visitors. This is not the case when it comes to Sri Lanka which is a diverse and rich destination, hence the view that we don’t need gaming. What is your take on this? A: Right now Sri Lanka may be tapping the low-spending segment of tourists. At some point in time, Sri Lanka will need to draw the high spenders in greater numbers. The advantage of having big casino operators is that they know how to develop world-class entertainment, leisure, food and beverage and shopping experiences. They will drive lot of these high-income activities or value additions. So tourism is one sector with a great future upside. Sri Lanka must focus on the basic industries as well, such as value-added tea, spice, apparel and IT outsourcing. The previous Government did the right thing by putting greater emphasis on infrastructure and this must be continued. Q: The new Government was voted into office on the assurance of good governance, transparency and accountability. How do these issues influence investors? A: Yes, I welcome all of these. If you have transparency, that helps a lot. We find that governments that promote transparency govern better and get better results at the end of the day. That also means a need for better planning. The Government needs to come up with a more coherent plan as to where they are going in the next five years and how they will implement the plan. Having consistent national policies is key for the private sector, both local and foreign. Uncertainty is the biggest enemy of investments. Q: With Budget 2016 coming up, any advice on managing the budget deficit and reducing it? A: The Government needs to embrace privatisation and effective public sector restructuring. For example, State commercial banks can be privatised with the State selling a minority stake. There is no reason for the Government to be running these banks or commercial enterprises. However, preferably privatisation exercise via the stock market should encompass a broader segment of society, especially local retail and small investors with preferential allocation of shares. This will ensure wider distribution and make the public a direct stakeholder. This will also boost the capital market, which is still very small as a percentage of GDP. That will enable the private sector to raise more capital via the capital market. What privatisation does is that immediately it puts in a lot of revenue to the State, increases productivity with more efficient management, and increases tax revenue. Privatisation is a better way for governments to manage their fiscal programs and put more money in the hands of people. Q: Some of the big banks and State commercial enterprises have shielded themselves from privatisation on the basis that they are making profits and have paid dividends annually to the Government. For the State, these large enterprises are also cash cows whilst there is trade union resistance as well. These factors discourage governments from even considering a token listing of a minority stake. Can you comment? A: Yes I know about these arguments. However, the Government can still hold majority stake and divest the minority stake. The Government must realise that what privatisation does is that it establishes an incentivisation of the management, apart from separating it from the Government. As I said earlier, privatisation also increases productivity with more efficient management apart from boosting tax revenue. If you want a fast-growing economy, you need to increase productivity and the way to this is having a market economy. The Chinese are increasingly embracing this strategy. Q: Sri Lanka is exploring Singapore’s successful Temasek model. An amalgamation of EPF and ETF is also proposed. Your views? A: Merging EPF and ETF is good in using pension funds to make the most efficient and best investment decisions. Ithe n case of Temasek, they encourage private management roles for government enterprises. For example, DBS Bank is partly owned by Temasek but it is run by private management. Singapore’s GIC and Temasek also invest outside Singapore. Q: The rrevious regime was criticised for heavily borrowing on commercial terms. Any comments? A: The important thing is to try to avoid foreign currency denominated debt which can get hit over currency fluctuations. Sri Lanka must look at establishing a strong capital market as much as possible. Selling/listing a minority stake will help the capital market, which on a critical assessment hasn’t really progressed or taken off over the past few decades in comparison to some of the other emerging or frontier markets. Q: Going forward, can Sri Lanka expect higher investment by Templeton? A: Yes, it can be very big. For example, if you look at Thailand, we have invested about $ 30 billion. If you consider the 67 million population of Thailand, Sri Lanka is one-third, and we can easily invest about $ 10 billion as opposed to a $ 100 million equity portfolio at present. Sri Lanka must understand that there is no shortage of money. We are not the only ones as there are many others who would like to invest; the conditions must be right in addition to the availability of shares. Right now it is by appointment only if you want to buy shares. This is unfortunate for the country when it could raise so much investments. Q: Where would you rate Sri Lanka in frontier markets? A: Sri Lanka is somewhere in the lower middle part, not high or lowest. This is not because of the quality of the companies but more to do with liquidity. We have one of the largest frontier market funds, which is $ 3 billion, and the $ 100 million exposure is very small. So there are plenty of opportunities. 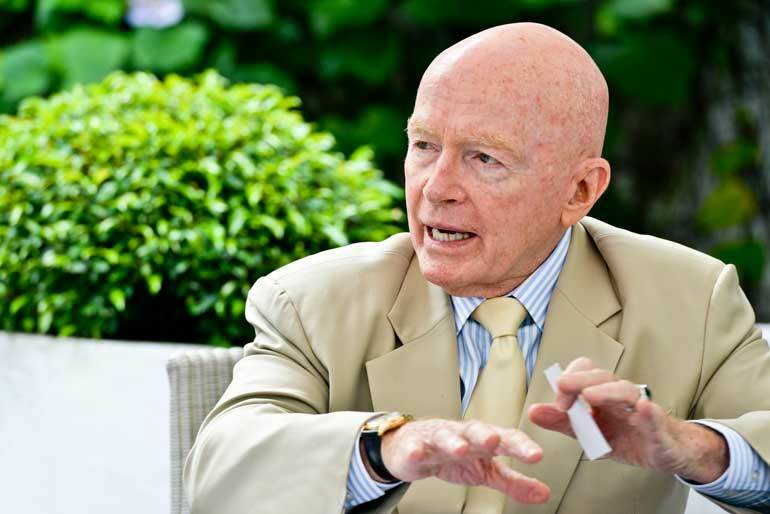 Q: What is Templeton looking for from Sri Lanka and what can Sri Lanka expect from Templeton? A: We are looking for more clarity in policy and a business-friendly regime. We are looking forward to the 2016 Budget as well. If opportunities come along, we will seize them. We are also looking at private equity in Sri Lanka. We could do a lot more. The Government must encourage more listings by incentivising the private sector. This has worked in other parts of the world. Listing companies is good because it ensures good corporate governance and transparency. Q: Any political advice to the current unity Government? A: Make governance inclusive and transparent and minimise political conflicts. Continue with good policies and programs of the previous regime, if any. The Government must make people stakeholders of the development process and empower them with more wealth in their hands. 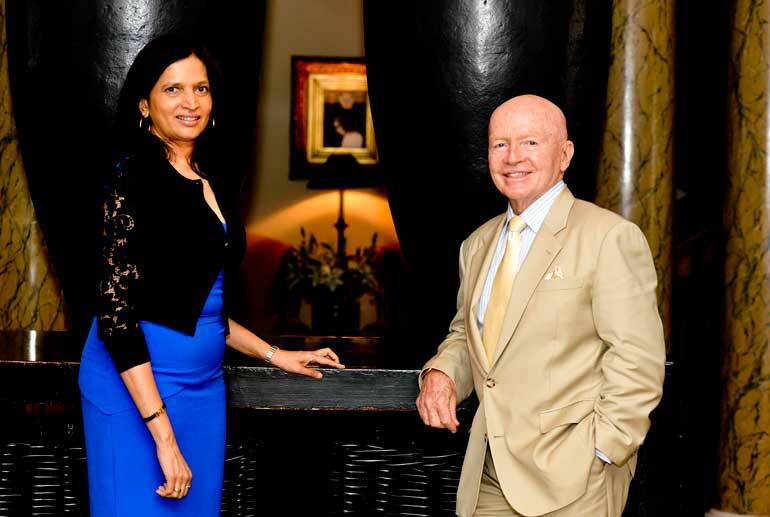 Dr. Mark Mobius with the Singapore-based consultant to CT CLSA Marianne Page, who has played a leading role in promoting the Sri Lankan capital market to foreign investors since the early 1990s.